This image shows Titan in ultraviolet and infrared wavelengths. It was taken by Cassini's imaging science subsystem on Oct. 26, 2004, and is constructed from four images acquired through different color filters. Saturn's biggest moon, Titan, may possess the kind of chemistry that could eventually lead to life, albeit without water, a new study finds. Titan is larger than the planet Mercury, making it the biggest of the more than 60 known moons orbiting Saturn. The moon's surface is covered in rivers, lakes and oceans of methane, which also rains from the sky. This methane cycle, similar to Earth's water cycle, can make Titan seem like an equally familiar and alien location. Although Earth and Titan have major differences — for instance, Titan is much colder, is poor in oxygen and lacks surface water — Titan has a surface atmospheric pressure similar to Earth's, and is the only place in the solar system except Earth where rainfall erodes the landscape. On Earth, water flows in a cycle, raining from the sky, pouring down rivers and streams to oceans and lakes, and evaporating under sunlight into mist, forming clouds that eventually rain down. 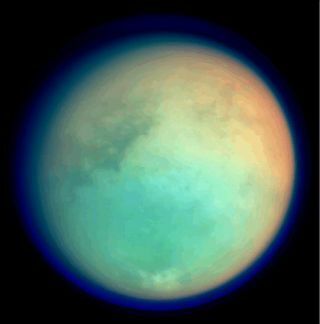 Probes sent to Titan have revealed that methane flows in a similar cycle of rivers, lakes and clouds over an ice crust. The methane cycle, frigid climate and lack of liquid water on Titan's surface make it a window into what life might be like on a world radically different from — and yet, in some ways, very similar to — Earth. In the new research paper, Jonathan Lunine, a planetary scientist at Cornell University in Ithaca, New York, and his colleagues investigated what prebiotic chemistry — the kinds of reactions that might lead to life — might be like on Titan-like worlds. Hydrogen cyanide can serve as a precursor to amino acids and nucleic acids, which are the building blocks of key molecules of Earth life, such as proteins and DNA. Prior work found that hydrogen cyanide is the most abundant hydrogen-containing molecule in Titan's atmosphere. Previous experiments suggested that hydrogen cyanide molecules often link together to form a compound known as polyimine. Now, the research team's computer models show that polyimine has interesting properties that might support prebiotic chemistry in the kind of ultracold temperatures seen on Titan. The scientists found that polyimine can absorb a wide spectrum of light, including wavelengths that can penetrate Titan's smoggy atmosphere. This suggests that it can soak up energy from the sun that polyimine could then use in chemical reactions on Titan's surface, they said. Moreover, polyimine has a flexible backbone, meaning that it can adopt several different structures, from sheets to more coiled shapes. The researchers suggested that some of these structures might act like catalysts to accelerate prebiotic chemical reactions. In addition, other shapes could interact to form more complex structures that could host prebiotic chemistry — for instance, porous stacks of sheets could form. These stacks of sheets, in turn, could support delicate chemical reactions in them and let molecules drift in and out, the researchers said. "We are not saying we created Titan life in a computer, or even structures that might be in life on Titan," Lunine told Space.com. "We are saying that the early steps toward structures, catalysis and absorption of energy might be possible on Titan with polymers like those we modeled." The researchers noted that polyimine might be present on Titan and might have escaped detection because Titan's murky atmosphere would make it difficult to identify. They added that future missions to Titan could be designed to look for polyimine and learn more about a potentially exotic kind of biochemistry. "We need to go back to Titan and analyze the surface composition and search for polymers," Lunine said. The scientists detailed their findings online July 4 in the journal Proceedings of the National Academy of Sciences.